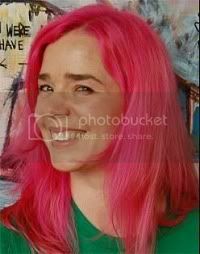 Ever since Laini's debut novel Dreamdark: Blackbringer I have LOVED her books and her awesome pink hair (her personality is pretty good too *wink*). This year she is releasing the much-buzzed Daughter of Smoke and Bone. I had a chance to read DoSaB earlier this year and I was floored. It's definitely in the running for the best book I've read all year. I was SO EXCITED when she agreed to be featured. I hope you enjoy her interview and take the chance to enter to win a SIGNED ARC of Daughter of Smoke and Bone. What’s your favorite thing about birthdays and why? I love planning parties: baking a cake, getting out a pretty table cloth, buying flowers. My daughter’s second birthday party was just days ago, and it really was a creative outlet for me. I had too much fun making little cupcake toppers out of thread spools, going overboard on balloons, and all that good stuff. Presents are good too! Clementine is already TWO?! How time flies! I LOVE planning themed parties, but parties in general can be tough. If you could invite any person (living or dead) to your birthday, who would it be? Hm. JK Rowling, maybe; I’d love to be tea friends with her, wouldn’t you? Just chat? Yes! I've always wanted to know what kind of person could do the things she's done. Which of your books was the most enjoyable to write? Most difficult? Well, Daughter was probably the most fun in terms of periodic sheer joy, but it had its rough patches too. Lips Touch was written without publication in mind, so there wasn’t “preciousness” and I was able, most of the time, to write just for pleasure. Silksinger was the hardest. It just had a lot of work to do — it was the second book of a planned five-book story arc, and it had to fit within the grand framework while also standing alone. Plus I bit off a lot with multiple crossing storylines, and sometimes I felt like slamming my laptop shut on my head. But in the end I was so happy with it, and there are some people close to me who claim it is their favorite. I hope we'll get to see all five of those books someday! But your two most recent books (Lips Touch, and Smoke and Bone) are quite different from the world of Dreamdark faeries. 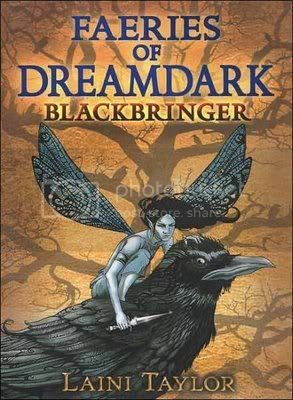 What prompted the change from the more “fantasy” story of Dreamdark to paranormal? Would you consider writing other genres such as dystopia or contemporary fiction? Well, it wasn’t conscious, especially with Lips Touch. Those stories all started out as short exercises I did for fun while decompressing from Dreamdark. But I don’t think they are drastically different, really, aside from the target age group. I would class Lips Touch and Daughter as fantasy more than paranormal. The purloining of folklore elements is very much present in all my books, sort of rewoven and altered and added to. I am very much interested in trying more genres. My kneejerk to dystopian is to say no, but I do have some stories in mind that fit there better than elsewhere, and as for contemporary: I would say it might be “contemporary-ish,” because I expected at least some magical realism would creep in. I can’t help myself. I love fantasy! I am interested in steampunk and sci fi, historical (especially Raj-era India, as in Spicy Little Curses) and of course romance, but as rendered by me, I think they will all turn out to be fantasy. Are you working on the Smoke and Bone sequel? Does it have a [tentative] release date? Yes, I am! The plan is a year after Daughter. It has no working title yet; I’m just calling it “sequel.” I thought I had come up with a great title and google informed me it was already taken … by Jack Kerouac. (Hint: it was not On the Road.) Darn it! I think you could give Kerouac a run for his money! Would you ever trade lives with any of your main characters? If so, who? Karou, for all that her life is pretty fraught, is a character of wish fulfillment. She’s just awesome. Beautiful, talented, speaks all these languages, can fight. Of course, if a genie really gave me the choice: “Laini, you can be you, or you can be Karou,” I’d pick me, but she is very fun to live vicariously. The same goes for Magpie. Her life is pretty fantastic, traveling to the farflung faerie holdings of the world with a troupe of gypsy crows? I love the texture of her life, the campfires and caravans, and best of all, the close-knit “family” she has assembled for herself. All right, so if you lived in Karou’s world, would you rather be human, angel, or chimaera? And if you were a chimaera, which form would you like to take? Hm. Again, I would want to be Karou, with all that that entails. Ha ha! (If you’ve read the book, you know what I mean.) If chimaera, I’d go with Kirin. I would love to see an artist’s rendition of a sleek, powerful Kirin warrior, long horns, sharp wings, crescent knives. Estella had been irridescent for a long time, and sometimes the romance had feared that she would never die, that he would be hamstrung by her human teeth forever. But now she was seething. Growing uncanny. Pain became plain in every furrow of her wings and in the way she moved boldly down the dead tunnels to their morning meetings. She was dying at last! 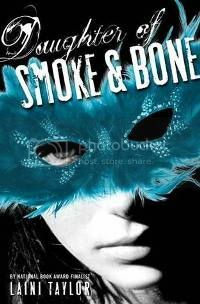 Today's giveaway is hosted by Candace @ Candace's Book Blog, and as promised you could win a SIGNED ARC of Daughter of Smoke and Bone! This book is AMAZING! So go enter NOW! Did anyone else immediately google Jack Kerouac to try and guess what the potential title-that-never-was might be? Oh My God i LOVE the cover! im sooo excited for this book! Thanks ALOT for the giveaway!! haha im going straightaway after this to google the title that was taken! :P love the cover and i wish i'd be bold enough to dye my hair this color! its pretty. I love your name! It reminds me of one of my favorite series, THE BOOKS OF BAYERN by Shannon Hale. Why, you may ask? One of the main characters names is Enna, and the others nickname is Isi. Loved the interview! We're definitely Laini Taylor fans (after reading Lips Touch, and we just started Daughter of Smoke and Bone) so it was fun to hear from her. Thanks for the giveaway too! @Gretchen Alice- I definitely tried to figure it out, but could not! Also, Daughter of Smoke & Bone is another book that I am just dying to add to my shelves! Thanks for the giveaway! I like theme parties too! I baked a Hobbit hole cake for my friends surprise Lord of the Rings party.It took forever! Loved the interview! Love you Laini! Love your books! I've been seeing a lot about Daughter of Smoke and Bone on different blogs I follow, wow the reviews have been top notch. I truly can't wait to read this one!!!! 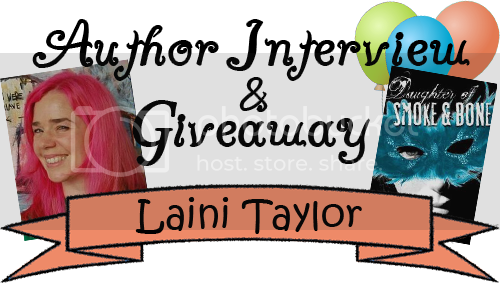 Yay, thanks for the interview with Laini Taylor! I LOVE her. Finished reading Daughter of Smoke and Bone this week and I loved it just as much as Lips Touch. Beautiful writing. Really looking forward to the sequel now. I think he title might have been Desolation Angels, which would have been excellent! Love the insight to the series, as I've never read this book! Also the mad-lib is so dark, which seems to fit perfectly with the sense of the book! Love her pink hair! I've never heard of her - I will have to check out her books now, I guess! I am SO psyched to read Daughter of Smoke and Bone, and I'm really excited about the second book already planned for publication!! Thank you for an awesome interview and giveaway! P.S. I also would like to go to a tea party with JK Rowling! Great interview. I read the teaser booklet that my local bookstore was giving out and can't wait to read the novel. I love her, I love her. Laini is so freaking amazing! I love Lips Touch three times. And the pink hair...awesome. Dying to read this book! Most awesome cover I've seen in awhile. Laini Taylor has awesome hair! Seriously! Planning themed parties is always fun! Laini sounds like a really great person to interview! I can't wait to read Daughter of Smoke and Bone :) Thanks for the giveaway! I am so excited for this book. I really think this is going to be a great one! Thank you so much for the interview! I've heard good things about her books, but I've never read any of them. I should see if we have them at the library. Thanks for the great interview! I love Laini's previous books. great interview! And I have to agree about JK Rowling being a fun person to share tea with. I've been hearing/reading a lot of good things about the Dreamdark series and now about Daughter of Smoke and Bone, which I am becoming increasingly eager to read for myself. I'm glad a sequel is in the works, but it's too bad it's a whole year away. If I end up loving DOSAB as much as I think I am, waiting an entire year is going to be torture. Smoke and Bones is one of my most anticipated reads of the year. This book is one I have been dying to read! The buzz is that this book is phenomenal. Thanks for the chance to win a copy!!! There is a lot of mythology about Kirin. So interesting! Great interview. Cupcakes are always fun to make but I never have the time to decorate them how I would like. I really love the cover of this book, the blue really pops. I will definitely be checking out more works by this author. I can't say it enough. She really is that good. Well done Laini Turner! she opened up a whole new world to explore and the writing is rich and fantastical. i really rooted for the love in this book and karou is such a unique heroine. i couldn't put it down, in fact, i read it again right after i finished. i think one of the best parts about this is that it is so well crafted and the descriptions are so fully formed that it is beyond easy to fall into the world and get caught up in the story.